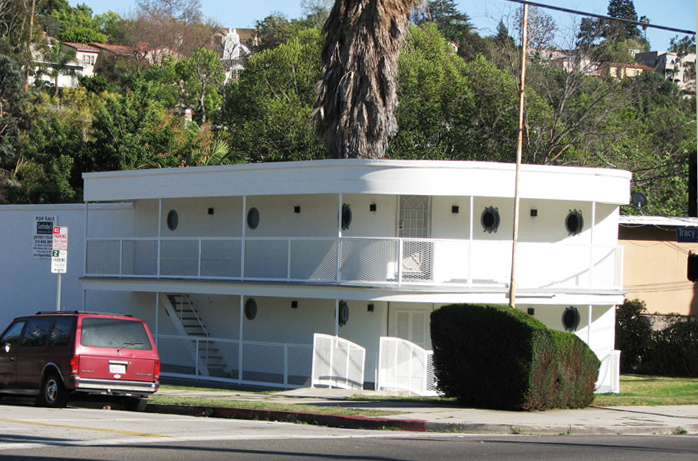 This Streamline Moderne structure was built by the Gospel quartet known as “The Crew of the Good Ship Grace.” Founded in 1934, the singers did a repertoire of traditional Christian hymns and contemporary Christian music. The building embellishes a nautical theme that was very prevalent in many of the mid 20th Century Christian ministries, especially among the youth movements. The structure is designed to appear like a boat floating on the grassy waters of the properties landscaping. The Crew named the studio building “Haven of Rest” in reference to God being a port providing safety from the storms and tumults of life. No architect is noted on the original permits, but the design was subsequently approved by the City Arts Commission. A city employee named Roberts stated on the back of the permit that an architect would be required to finalize the plans, however that person’s name did not appear anywhere on the two permits. Whoever did the design, it exemplifies the character defining features of the Streamline Moderne style with an emphasis on the nautical elements, such as a gangway for the entry, nautical railings and lights, as well as port holes for the windows.